These Bigfoot toys and dolls in our catalogue are a must have not only for your little ones who love Bigfoot but even for display in your car or Bigfoot collection corner. Collect Bigfoot toys and dolls from some of the major toy manufacturers like Fisher-price and Matterhorn. Paradise Longboard Built Tough 10" x 37.63"
Paradise Longboard Beachfront 2.0 9" x 40"
Paradise Longboard Zombie Panda 10.25" x 39.5"
According to local lore, the Sasquatch is a great and terrible creature feared by all. 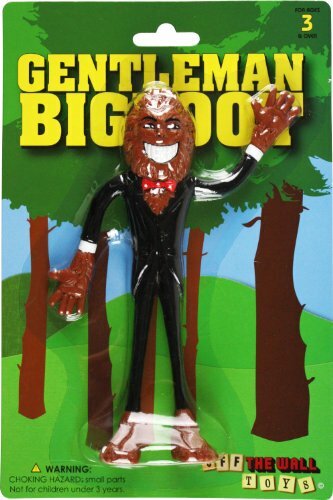 Gentleman Bigfoot is not such a creature. Unlike his brutish cousins, this refined gentleman roams the great conifer forests of the Pacific Northwest in search of fine dining and polite company. While we were never able to convince him to pose for a photograph, he did allow us to sketch him in exchange for a proper lunch and three jars of Gourmet Mustard. After all, a true gentleman does not seek out undue attention or personal fame, but instead chooses the life of humble refinement beyond the media limelight. Paradise Longboard Hideaway Harbor 9.5" x 39.5"
Paradise Longboard Pinstripe 9.75" x 48"
Paradise Longboard Island Life 9.5" x 40.25"
Paradise Longboard Neo 10" x 40"
If you play your cards right, Santa might put one of these fun decks of cards in your stocking! There's something here for everyone! No more boring bridge games! Cards are a great way to unplug and have some great family & friend time! Choose from: Bacon, Bigfoot, Emoji Happy, Emoji Poop, Wonderful Wiener, Retro Batman, Retro Superman, Retro Wonder Woman, Marvel Heroes, Marvel Villians, Spiderman, A Christmas Story, National Lampoon's Christmas Vacation, Elf, Kiss, Pink Floyd, Grateful Dead. Paradise Longboard Tommy One 9.5" x 40.25"